100% organic cotton sateen to match Candido Bedding Collections. Comes in Almond and Cobblestone Gray. The Purist line is an all natural line of luxury Bed linens that are manufactured and finished without the use of any chemical ingredients. No chemical bleaches, No chemical dyes, no chemical finishes are ever used in the Purist line of all natural fiber blends of egyptian cotton, linen, linen/cotton, virgin wool silk, cashmere and our innovative Legna fiber. 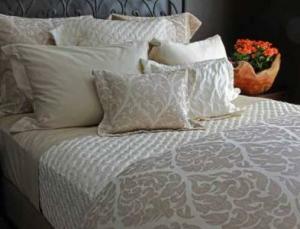 Purist fine bed linens add luxury, grace and beauty to your home while maintaining the pureness of nature. Made with 100% organic cotton, these Candido Sateen linens (as seen in image sheets & cases) are Certified by OekoTex, SKAL & GOTS. At 595 Threads per square inch they are as luscious as they are pure. These sateen linens will transport you to luxurious places in style and total comfort. Organic Luxury at its finest to drape you in majestic splendor. You’ll sink into them with the same satisfied exhalation that one has upon sliding into a hot bath. Bedskirts are gathered. Machine washable & dryable. Swatch to left shows Almond & Cobblestone Gray. Image above shows Purists Candido Genoa Duvet & Shams, Purists Mino Blanket & Sham, Purists Plouf Sham, and Purists Candido Doppio Sateen Sheets & Cases in Almond. Click here to check out the Purists Genoa Covers & Shams too - a perfect complement!